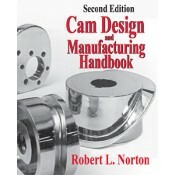 Purchasers of this book will receive information on how to get $100 off the regular price of the cam design program DYNACAM Plus! The use of computers for engineering design, and in CNC for manufacturing, has dramatically changed the cam design and manufacturing process. Additionally, cam design and manufacturing have been affected by a significant number of fundamental research results published in recent years. This new edition offers changes which have been made throughout the book to update its information with the latest technology from the engineering literature and from the author's research and that of his students. Beginning at an introductory level and progressing to more advanced topics, this it provides all the information needed to properly design, model, analyze, specify, and manufacture cam-follower systems. It is truly a comprehensive resource that brings together up-to-date cam design technology, correct design and manufacturing procedures, and recent cam research results-all in one volume! Additionally, this unique book is accompanied by a 90-day trial demonstration copy of the Professional Version of Dynacam. Written by the author and used worldwide, this program solves the equations described in the book and allows in its fully licensed version the design, dynamic modeling, analysis, and generation of follower center, cam surface, and cutter coordinate data for any cam. It also defines conjugate cams for any application. • Includes a completely rewritten and updated chapter on splines, along with a discussion of shape-preserving splines as currently used for automotive valve-train cams. • Features added coverage of multi-degree of freedom models and of followers with deliberate impact events within the chapter on dynamic modeling. • Covers Globoidal cams in several chapters. • Provides a definitive solution to the torque compensation cam design problem. • Program Dynacam is much enhanced and improved and is available at a preferred price to purchasers of the book.